With Brian Cashman seemingly fully in control of personnel decisions, the New York Yankees have continued a calculated approach towards a youth movement this winter. 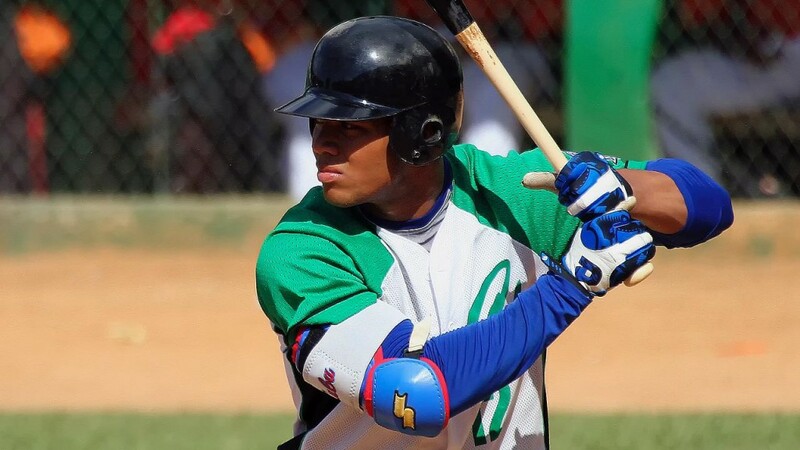 Signing Cuban super-prospect, Yoan Moncada, would be the crown jewel of the off-season and make him immediately the top prospect in the Yankees’ system. Each transaction thus far has been an obvious attempt at making moves for 2015 and beyond as opposed to a one season franchise attempt, something the Yankees had been attempting for over a decade prior. Moncada would be the “finishing move”, the sort of deal where New York would solidify answers for a multitude of problems for years to come. And yes, we’re all aware of Rob Refsnyder, more on that in a moment. To understand the important and logic behind a Moncada splash, it’s important to summarize how we’ve gotten to this point; a place where New York dumping eight figures on an unknown quantity is a drastically different move from the ones we’ve seen since the turn of the century. Didi Gregorius made the Yankees 15 years younger at shortstop, a mandatory position for youth and he came with about $12 million in savings (around $9 million if you throw in the $3 million still owed to Martin Prado this season). Gregorius is 25-years-old and signed through 2019. Chase Headley finally puts to rest the hostage situation at third base. Alex Rodriguez is a salary who can lend a potential offensive boost. Being able to evaluate him as such was important (as opposed to third baseman of the future and cornerstone player) and it finally happened (officially) this winter. Headley is still just 30-years-old and signed through 2018. Brian McCann isn’t so young as a catcher (31-years-old before the season starts) but he is likely to provide enough value to hold down a spot in the lineup and a position in the field through 2018 when his contract expires (he could move over to first after 2016 when Teixeira’s contract expires or stay behind the plate depending on how a prospect like Gary Sanchez performs the next couple of seasons). In total, the Yankees have most of their core essentially signed and ready for the future. It’s a magic trick through two winters of effort. Jacoby Ellsbury, Brett Gardner, McCann, Gregorius and Headley are all signed through at least 2018 and none of them will be older than 35-years-old by that time. The only offensive starters who will be? Teixeira, A-Rod and Carlos Beltran, all of whom have expiring contracts by 2017 at the latest. The pitching staff is an even better indication. Nathan Eovaldi, Masahiro Tanaka and Michael Pineda will all be 30-years-old or young by 2018 and none but Tanaka are under contract through 2017. Even Dellin Betances, arguably the best young reliever in the game, is only now headed into his prime. So what are the missing pieces? Second base and right field. New York can conceivably lock up its own pitching and have four starters still in their primes along with most of the offense through 2018. They can build a 2-3 year window of basically every player in his prime or before his twilight, at once. Hiroki Kuroda is gone as of this winter, CC Sabathia is gone after 2017 at the latest (vesting options and buyouts pending in 2017). New York’s payroll is $20-30 million less than it was in 2013, a conscious effort, but it would be wise to sign players who can help long-term as they come, with that kind of buffer, and then watch their three most expensive contracts totaling over $60 million in payroll in their three most washed-up players (Tex, Sabathia and A-R0d) evaporate in the next three years. Add Carlos Beltran and that’s $75 million in nearly dead weight at the same time players in their youth are playing for contracts and attractive free agents come about. That sort of money can buy an entire starting rotation if it came down to it. Yoan Moncada fits the bill in every aspect of what the Yankees are doing. He’s 19-years-old and likely won’t be ready for the majors in 2015, but could contribute as early as 2016 or 2017 if the ceiling rings true. He can play second base, something Stephen Drew will man on a one year contract this year and which will yield a wide open spot in 2016. Moncada has elite power and would likely be the equivalent to a first overall pick in this year’s draft or a top 20 prospect in all of baseball right now (possibly top 10 depending on who you want to believe). Moncada is the type of guy the Yankees should be flexing their money on. He won’t add as much to the payroll as his potential value, he’s an international signing for a pool the Yankees have already blown through in terms of allowance and, not for anything, Cuban imports haven’t been doing so badly for themselves the past few years. In 2014, Jose Abreu won the AL Rookie of the Year Award. In 2013? Jose Fernandez in the NL. Second place? Yasiel Puig. Second place in the AL? Jose Iglesias. Second place in 2012 in the AL? Yoenis Cespedes. Five Cuban-born players have qualified as the “top 10” rookies of the past three years. Jorge Soler should be a strong candidate to win it for the NL in 2015. If there is a safer bet on an unknown quantity right now, we haven’t seen it. Moncada would likely cost around $50 million in a “signing bonus” and potentially another $50 million in tax penalties for the Yankees. But much like the posting fees of old, the latter half of a potential $100 million commitment won’t count as anything but a check, something the Yankees undoubtedly do not care about if it means getting a “first overall pick” out of thin air. Signing Moncada means having a top prospect into his prime, it means moving him to second base, and up the middle for the Yankees being signed through 2018. It means potentially signing elite talent twice this year (since they also still have a first round draft pick). Finally, it means there is still hope for Rob Refsnyder, who is more or less major league ready but many assume would be blocked from the Yankees if Moncada joined the roster. The simple solution is Refsnyder can be re-tried in right field, his college position and somewhere he has dabbled during the minor leagues. The Yankees seem to prefer him in the infield, but if it meant getting to keep Refsnyder for six years and Moncada likely a similar amount, isn’t that something New York would live with? Stephen Drew can play second base this season with Refsnyder the first one called up if he struggles or Beltran (or A-Rod) gets hurt. In 2016, Moncada can likely play second (or Refsnyder if Moncada is still not ready) and Refsnyder can take over for Beltran after 2016, when his contract expires. Essentially, while the Yankees have injury prone players such as A-Rod, Beltran and Teixeira under contract the next couple of years, Refsnyder can be used to gobble at bats). For $10 million or so per season in payroll, the Yankees have the potential (and that’s all this is for now) to have two every day players, which actually makes this whole thing quite the bargain. It would allow New York to use all that money coming off the books to find just a first baseman and nail down the pitching situation, plus arbitration. It’s a clearer path with Moncada onboard and all it would mean is reaching for a little strategy from the past, blowing the other big market teams out of the water with the checkbook.